Fortunately, we’ve made backups a one-click operation. 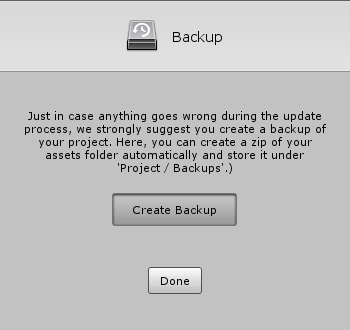 In the menu, choose Tools > Ludiq > Backup Project…, then click on Create Backup. You can quickly open the backups folder via Tools > Ludiq > Restore Backup…. It is absolutely essential to backup your project before updates, but that doesn’t mean you can’t do it at other times! It’s good practice to make frequent backups if you do not use version control. We recommend using a version control system (VCS) such as Unity Collaborate, Git or Subversion instead of this rudimentary backup utility. Once a new version has been downloaded and imported from the asset store, the update wizard should automatically open. 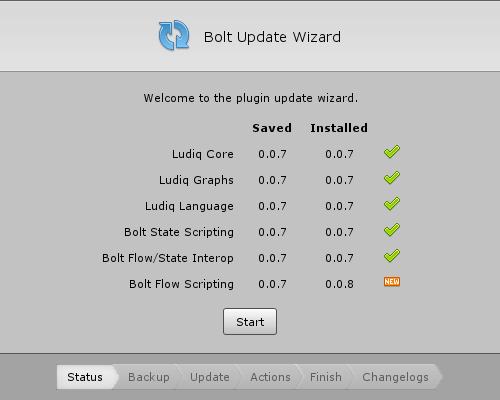 If not, you can open it manually via Tools > Bolt > Update Wizard…. Make the world better! I am a professional with a considerable experience in IT & Cloud Service - Product Management and movie directing. I have got the most experience in: - business development; - product and project management; - software development; - game development; - consumer electronic development; My greatest interests are high innovation technology projects on the Russian market.